InfoFlo is an innovative yet simple-to-use CRM solution created for freelancers and SMBs. Serving as a one-stop-shop tool for managing contacts and business relationships, this platform is known for its competitive pricing plans. It is currently the most affordable CRM software on the market at a $99 one-time cost inclusive of free upgrades. Infoflo offers one of the most powerful Outlook sync on the market. It leverages your CRM tool with its project management and phone system integration. Your data is secured both in your private cloud or on your local network. By centralizing your customer relationships in a single platform, you can quickly access, view and manage your data in a single glance. 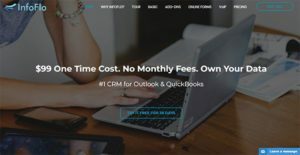 On top of that, it is even equipped with integrations to calendar tools, email programs, and products like Google Sync, Outlook, and QuickBooks. InfoFlo offers a complete contact management solution by tracking, managing, and automatically linking pertinent information about your business contacts. All you need is a single-click access to retrieve all your information. It also offers you a look at your business relationship with your customers to see your previous exchanges and deals. With just one click, InfoFlo can instantly connect you with a specific contact or a company or a number of them on various collaboration projects. All information is then automatically shared. You can use InfoFlo to track leads and search for more possibilities for growth. It allows you to review the deals you and your sales team are working on. What makes InfoFlo a good business solution is it can integrate all details of your contacts and clients directly from Outlook or an an Outlook formatted CSV file. InfoFlo allows you to do email and calendar management, so correspondence as well as events and meetings are organized and stored. It can also do notes, task, and recordings management which you will find useful in your business. InfoFlo lets you view a live feed of your Twitter, LinkedIn, and Facebook account. Now you can post to those social media accounts and view all the information within InfoFlo. It is also fully integrated with Skype allowing you to call contacts on your Skype account right from InfoFlo. With a built-in 512 bit encryption, all your information in InfoFlo is virtually secured. You can transform any office into a virtual one with this security software. It can also centrally backup and restore the entire InfoFlo database, including users, contacts, documents, and all other information. What Problems Will InfoFlo Solve? Every company has its own characteristics, and may require a specific Contact Management Software solution that will be fit for their business size, type of customers and employees and even particular industry they cater to. It's not wise to count on getting an ideal solution that will work for every company no matter what their background is. It may be a good idea to read a few InfoFlo reviews first and even then you should keep in mind what the solution is intended to do for your business and your employees. Do you need a simple and straightforward solution with only essential functions? Will you really use the complex tools required by experts and large enterprises? Are there any particular tools that are especially practical for the industry you work in? If you ask yourself these questions it will be much easier to locate a trustworthy app that will match your budget. How Much Does InfoFlo Cost? We realize that when you make a decision to buy CRM Software it’s important not only to see how experts evaluate it in their reviews, but also to find out if the real people and companies that buy it are actually satisfied with the product. That’s why we’ve created our behavior-based Customer Satisfaction Algorithm™ that gathers customer reviews, comments and InfoFlo reviews across a wide range of social media sites. The data is then presented in an easy to digest form showing how many people had positive and negative experience with InfoFlo. With that information at hand you should be equipped to make an informed buying decision that you won’t regret. A great and realtively affordable tool to communicate with colleagues daily. Firsthand impressions using this tool for CRM and and managing projects. What are InfoFlo pricing details? What integrations are available for InfoFlo? Pros: I'm working in a satellite office company. I constantly need interaction with other people in different offices within the Florida area. This tool ensures my projects, daily activities, companies, and contacts are all secured in one place. What's more, I get to share my information to my colleauges daily. Cons: So far, I don't have anything to complain abouot this wonderful tool. It can do just about everything that I want it to do. The greatest thing with this is that I don't have to resort to paying any monthly fees to use it services. I treature this tool so much. Pros: Outlook sync and the ability of custom programming. Also the initial migration from our legacy system. One time perpetual license and no annual software maintenance. Outlook sync and the ability of custom programming. Also the initial migration from our legacy system. One time perpetual license and no annual software maintenance. A CRM database that's very simple to operate. At last! A robust and affordable CRM that can be utilized with Outlook. If you need more information about InfoFlo or you simply have a question let us know what you need and we’ll forward your request directly to the vendor.